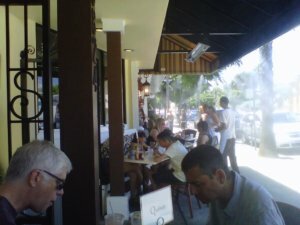 Outdoor misting at the hot spot Sweet Butter in Sherman Oaks creates ambiance and cooling for guests! This restaurant is known for attracting celebrities and we are certain that their Koolfog patio misting system is a big reason why. Yelp user Lisa F. commented, “Food was nice, coffee warm, service friendly, and plenty of outdoor seating with cool mist for hot mornings.” Clearly, Lisa appreciated the extra mile that Sweet Butter goes to keep their guests comfortable! Outdoor misting adds an extra level of comfort and luxury to any restaurant. Guests and passerby’s will be enticed by the cooling mist, which is perfect for any hot climate. Diners will be sure to frequent a restaurant that offers the added benefit of cooling on patios. Our systems do not leave any wet residue behind so tables, napkins and diners will stay dry! Creating a comfortable atmosphere is key to attracting repeat visitors and a visible attraction to new customers. An outdoor misting system from Koolfog is a great way to add a new element to your restaurant!